Charter Flight Group provides an unparalleled level of service for clients seeking private jet charter flights to Teterboro, New Jersey. With thirty years of aviation experience, Charter Flight Group offers you convenient access to the newest and safest private aircraft in the industry today. We offer everything from small-capacity light and very light jets, such as the Citation Mustang and the Lear 31, to turbo-prop and heavy jets like the Falcon 900, the Gulfstream V, the King Air 350, and all types of private aircraft in between. When you choose Charter Flight Group, a recognized leader in private jet charters, you will have access to thousands of worldwide airports. 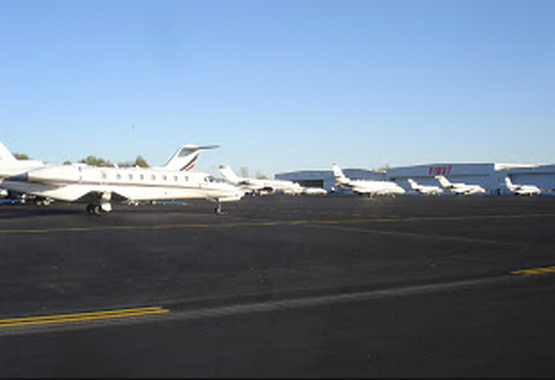 Teterboro Airport (KTEB), one of the oldest and busiest airports in the nation for private aircraft. Charter Flight Group is available 24/7 to schedule your private jet flights in and out of Teterboro Airport for all of your corporate and personal travel requirements. Each of our global partners meets the stringent Federal Aviation Administration (FAA) Part 135 standards for aviation operation, aircraft maintenance and licensing. CFG goes beyond our competitors to perform third-party safety audits through global aviation safety leaders. We utilize Aircraft Research Group of the United States (ARGUS) and WYVERN on every charter flight we arrange. This ensures that our partners are always in compliance and demonstrates our commitment to your safety. Teterboro is a busy general aviation airport located on the East Coast of the U.S. in Bergen County, New Jersey, a mere 12 miles from midtown Manhattan, New York. Teterboro began operations for the first time in 1919, making it the oldest operating airport in the New Jersey and New York Metropolitan area. It was operated by the U.S. Army during World War II and was purchased in 1949 by the Port Authority of New York and New Jersey. In 1973, Teterboro was the first airport in the nation to receive certification for safety under Part 139 of the Federal Aviation Regulations. airport (827 acres, taking up most of the city of Teterboro) to be the most convenient entryway to the New York City area from both foreign and domestic destinations. Easy access to Manhattan is available via the George Washington Bridge to the north or the Lincoln Tunnel to the south. 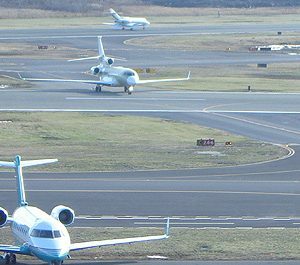 Charter a private jet in Teterboro to learn why this airport is a favorite among dignitaries and business executives who travel in and out of the region. Avoid the congestion of La Guardia, John F. Kennedy International, and Newark International Airports. Private jet charter flights to Teterboro will place you within a few miles of Midtown Manhattan, the largest central business district in the world. If your private aircraft charter is business related, you will find the New York Stock Exchange, NASDAQ, Wall Street, and the new 7 World Trade Center building (completed in 2006) situated nearby. In addition, you will find the headquarters of more than 45 of Fortune 500’s U.S. corporate giants. New York is also called the “media capital of the world” because it is home to the headquarters of three of the top music recording companies, major publishing houses, and a TV and film industry second only to Hollywood. If your private flight charter is for pleasure, the Teterboro area offers an exceptional variety of attractions. In New York, see the city from atop the Empire State Building; go ice-skating at the famous Rockefeller Center; take a ferry to the Statue of Liberty; enjoy masterpieces at the Metropolitan Museum of Art; stroll through Central Park; and take in a Broadway show in Times Square. If New Jersey is your destination, visit Jersey City’s nearby Ellis Island; take your kids to a NJ Devils hockey game at Newark’s state-of-the-art Prudential Center; or go a little further to enjoy Atlantic City, the gaming capital of the east coast, with its many casino resorts, championship golf, shopping and entertainment. If you are a private jet aviation aficionado, be sure to visit the popular Aviation Hall of Fame and Museum of New Jersey before leaving the Teterboro airport grounds to see their collection of historic air and space artifacts, art, models, thousands of aviation-related books and hundreds of video tapes. Why Choose Charter Flight Group for your Jet to Teterboro? Charter Flight Group can arrange private jet charter flights to Teterboro, New Jersey, or to any one of thousands of other destinations around the world. Our expert consultants and charter planners are dedicated to making your private jet charter flights exceptionally safe and convenient. You will always have the most experienced pilots and private aircraft maintained by certified professionals. Whether you are headed to Teterboro for business or pleasure, Charter Flight Group will exceed your expectations and provide you with the highest levels of safety, flexibility and exclusivity.